ST. GEORGE — A first glimpse of the Empire Outlets and hotel which promises to make Staten Island New York's next big destination has been released on video. 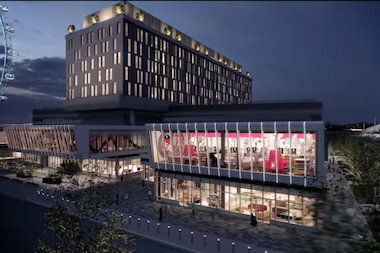 The movie shows 3D animation of the outlet mall, the New York Wheel and a 190 room "boutique" hotel being build near the St. George Ferry Terminal. "We’re beyond excited that construction has started on Empire Outlets," said Joseph Ferrara, principal of mall developers BFC Partners, in a statement. "This video showcases our vision about to become reality on the North Shore of Staten Island." The outlet mall will be the only one in the city when it opens its doors, scheduled for 2016. It will have more than 100 retail stores, restaurants and an art gallery. Retailer Nordstrom Rack was the first tenant announced to secure space at the mall. The mall will sit next to the 625-foot high New York Wheel, set to be the largest Ferris wheel in the world when it opens in 2017.